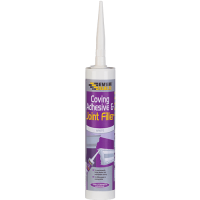 Coving adhesive is a high strength solvent free gap filling adhesive that provides a quick ‘grab’ for fixing polystyrene and plaster coving and cornices to sound porous surfaces. Dries white and is over paintable when dry. Do not apply Coving Adhesive at temperatures below +4°C. Coving Adhesive should be at room temperature when you begin using the product. If Coving Adhesive has been stored in cool conditions it should be placed in a warm room / bucket of warm water before use to gently heat up to working temperature.